Our banner hanging products are designed to hang most types of banners and signs from the ceiling or overhead pipes, beams, etc. You can get a complete kit, or make up what you need from our wide selection of components. 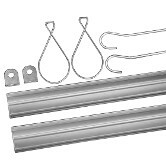 These poster hanging kits include everything needed to hang posters and banners up to 48" wide. Just choose the kit with the proper hanger for size and weight of your sign and the desired mounting method. Plastic snap rail, inserted into a beautiful aluminum shroud, creates a poster hanging system that can suspend large signs, grip a wide variety of materials, and provide a highly finished look for up-scale sign projects. 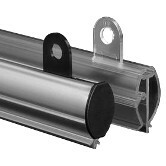 Plastic Snaprail™ features a quick-change, bottom-feed feature for simple sign changing. 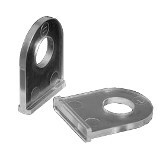 They are ideal for suspending large signs and for gripping a wide variety of materials. 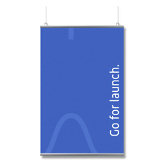 The NX series poster hanging rails are extra-rigid lengthwise, making them ideal for long graphics. The oval profile and the use of end caps gives the NX Snaprail™ a highly finished look. 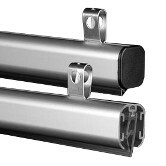 The appearance is similar to the aluminum snap rails, but at a more economical price. The EZ series poster hanging rails features smoother surfaces and a bigger gripping area than the standard Snaprail™ making it easier and faster to use. EZ Snaprail is designed for use with light-weight sign stock. For heavier signs use the standard Snaprail. These poster spines are a cost-effective solution for hanging lighter-weight posters. A wide opening at the bottom accepts thick stock, but, with internal gripping fins, the superail 2 tightly grips thinner stock as well. This economy poster hanging rail is a cost-effective means of hanging light signs on windows, walls, or from ceilings. The minimal design means that the poster rail does not visually compete with your sign. 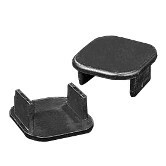 This foam-board edge-protector fits over 3/16-inch and 1/4-inch foam board and protects the foam board from denting and dog-ears. 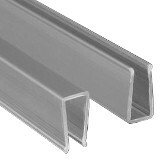 The edge-protector is available in six stock lengths which may easily be cut if needed to fit your sign. 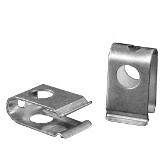 Aluminum banner clips are designed to provide a hanging point when used with our aluminum snap rails. 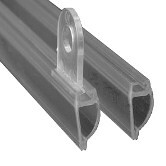 Aluminum banner clips slide into the top groove of the snap rail’s aluminum shroud and are easily positioned along the length of the shroud. 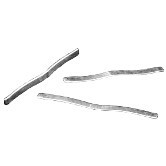 Universal banner clips are designed to provide a hanging point when used with the Superail 2 poster spines, but they will also work with the snaprail, NX snaprail, EZ snaprail, and economy banner rail. 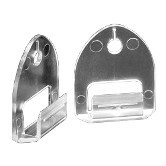 Universal banner clips slide into the top groove of the snap rail and are easily positioned anywhere along the length of the rail. Banner clips provide a hanging point when used with the snaprail, NX snaprail, EZ snaprail, Superail 2 poster spines, and economy banner rail. 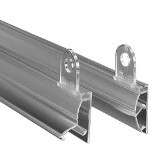 Banner clips slide into the top groove of a poster hanging rail and are easily positioned along the length of the rail. Economy banner clips provide a hanging point when used with the snaprail, NX snaprail, EZ snaprail, superail 2 poster spines, and economy banner rail. 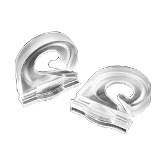 These clips slide into the top groove of a poster hanging rail and are easily positioned along the length of the rail. 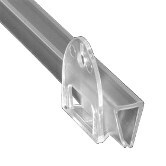 Valance clips provide a hanging point when used with Series 2 and Series 3 banner rails. 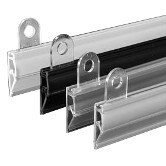 Valance clips slide into the bottom opening of a poster rail and are easily positioned along the length of the rail. Aluminum snap rail end caps snap into corresponding grooves on the shrouds of aluminum snap rails. Once in place, the end caps cover the exposed ends of the kit’s internal PVC snap rail, for a highly finished look. The NX end caps snap into corresponding grooves on the NX snap rails. Once in place, the end caps cover the exposed ends of the rails, for a highly finished look. 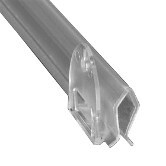 Metal splints are designed to provide a connection point when combining multiple lengths of poster hanging rails. 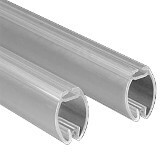 Metal splints slide into the top groove of poster hanging rails, bonding the rails together. These splints can be used with our plastic snaprail, NX snaprail, EZ snaprail, Superail 2 poster spines, and economy banner rail.